As she moves forward, she’s got a library of experiences in finance and tech to pull from. 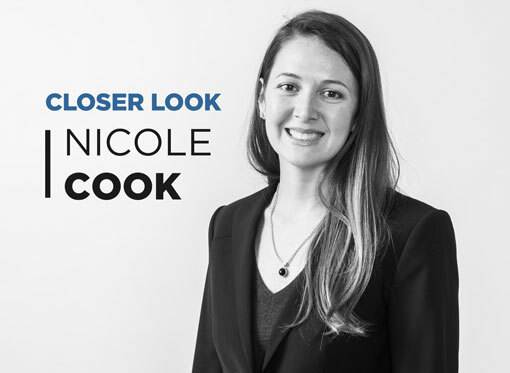 Cook spent seven years with BMO Capital Markets in Chicago, San Francisco and New York City, then joined Dwolla’s New York City office in 2012, then worked for the company in San Francisco from 2013 to 2017. After taking some time off, she connected with the co-founders of Speeko, a public speaking practice and coaching app that was about to undergo 90 days in the Chicago accelerator TechStars, where she worked as chief operating officer in 2018. Cook is also a managing partner at Five Island Ventures Partnership, and was one of the first investors in theSkimm and in Seven Sundays. “When I think about where’s the value that I can add to the entrepreneurs at the GIA, it’s having gone through those sets of experiences, and particularly looking at some of the relationships of the startups trying to build pilot programs with insurance companies,” Cook said. Tell us about your background in tech and finance. I grew up with entrepreneurial parents. My mom and dad ran two small businesses between Emmetsburg and Spencer for the majority of my upbringing. It was a retail business, so I would spend a lot of my time physically with them, kind of observing and learning their work ethic. During the different stages of growth of Dwolla and understanding who our customer is, I played roles of strategic partnerships with large financial institutions, as well as government entities both at a state and federal level. … Ultimately my last role with the company was as the vice president of sales and strategy, and it was leading the company through a focus on the business it is today, which is a B-to-B Saas [software as a service] business, which is different than the business it was when I started. So I lived through a lot of changes there. You have similar experiences to these GIA startups. How will that serve you in the GIA? It didn’t scare me to not have experience in insurance specifically. … I want to learn and I will learn in terms of the insurance side, but I’m surrounded by these 100-plus mentors who have some of that domain expertise. I can rely on them to be helpful to the startups in that way, whereas I can bring experience more along the lines of what it’s like to go through an accelerator, to be a very early-stage employee and go through these many changes of a company. That’s where I think my more immediate value will be. You joined Speeko as it was going through a Chicago accelerator. What were the challenges from a participant’s standpoint that were hard to anticipate? [Speeko was] at this inflection point of making a decision about how they were going to move this project that they had been working on for a couple of years in a nights-and-weekends capacity. One of those decision points was, what is the business model for this technology that we’ve built … and they also had started to have some opportunities for accelerator programs. I took a few phone calls with the founders, Nico [Aguilar] and Anthony [Pham, who founded Speeko with Will Field-Thompson], and just really started enjoying helping them talk through the problems they were trying to solve. Informally over the course of months, that just continued, and they made the decision to join the TechStars accelerator in Chicago and asked me to join them in a full-time capacity. The first third of the program was focused on mentors, and you meet with a lot of incredible folks who were willing to give their time in a mentorship capacity. … We were meeting with, maybe every day for three weeks, three to five people -- it’s a pretty intense time. They call it “mentor whiplash.” The hard learning is that you’re getting a lot of different feedback on the problem you’re solving, the value proposition you think you offer with your product or service. It’s being able to take all of that feedback and make critical decisions in a pretty quick time frame around what you are going to do with that information. … To be able to try to drive alignment across the team on some of that feedback can be challenging. How were you introduced to the Global Insurance Accelerator? I was familiar with the GIA for a number of years. Despite the fact that I have lived away from the state for the majority of my professional career since graduation, getting to work for Dwolla, which was based here in Des Moines, helped me stay connected professionally to the state. Personally, I’m a proud Iowa native, and … as I was part of the New York tech ecosystem, the Bay-area tech ecosystem, it was this trend of -- there are young talented professionals who are wanting to go back to the Midwest and be part of those communities. I was observing this momentum here in Iowa for years before I was here, and the GIA was one of those that I was watching. I was made aware of this managing director position becoming available and that Brian [Hemesath] was going to be ultimately transitioning out. … It just sat in my mind all the time. This position represents such a unique opportunity to bring together some of these different areas of my career to date that I didn’t know how that might be possible. … I’d also taken a personal interest in investing in founders and early-stage companies. I’ve only been able to do a few of those just personally, but it gives me a great deal of enjoyment to be able to use whatever experience I have to help those founders. I get to really do all these multiple things that I’ve enjoyed, but I’ve always had to do them in more of a silo. Having just gone through an accelerator when this came up, I was very fresh in terms of the value that can bring to an early-stage company. What do you expect to see in your first year at the GIA? I’m incredibly fortunate to have [Hemesath] overlapping through this 2019 cohort. He’s built a tremendous foundation. … That’s also going to offer me a lot of key insights into what’s working really well, as well as maybe where my set of experiences come in that just might be different from his as an entrepreneur. I’m really looking forward to working with the 13 investors to understand what’s important to them, and help realign where my experiences might be able to pull from my strengths to help move their initiatives forward. My vision for the GIA is to continue to impress upon this as a worldwide network for entrepreneurs, investors and mentors. … I’m also interested in connecting with the alumni from the first four years of the program. They bring great value to building the alumni base for the long term in the GIA and the community there. I’m currently reading Reshma Saujana’s book “Brave, Not Perfect.” I regularly listen to NPR each morning and theSkimm’s new podcast called “Skimm This,” plus “How I Built This” with Guy Raz, one of my favorite podcasts. 4/12/19: This story correct the years Cook worked with Dwolla in New York City and San Francisco.